Red Riding: 1980 begins more than five years after the last film. Reporter Eddie Dunford is dead. Builder John Dawson is dead. Paula Garland is dead. Crooked cop Bob Craven (Sean Harris) is now a detective. Chief Bill Molloy (Warren Clarke) is buckling under the pressure of a new set of serial murders terrorizing Yorkshire. And top cop Maurice Jobson (David Morrisey) still sits on the periphery of the action, ever watchful yet decidely unhelpful. 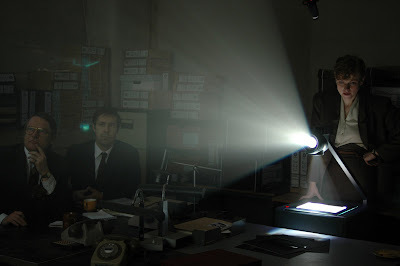 Into this tense atmosphere comes Peter Hunter (Paddy Considine), a dedicated officer assigned to re-investigate the unsolved Yorkshire Ripper case currently bedeviling Molloy. As cocky as Dunford was in his approach, Hunter is respectful, earnest. Yet even though the story perspective has shifted from that of a reporter to that of a cop, Hunter is just as much an outsider as Dunford was. And he's got problematic baggage, too—a needy wife whose miscarriage some time ago forced him to leave the Ripper case once already, and also led him into the arms of a fellow cop, Helen Marshall (Maxine Peake). One also begins to sense there's something sinister about the Reverend Martin Laws (Peter Mullan), not entirely helpful in the last film's investigation, but Johnny-on-the-spot in this investigation. He provides a shoulder to cry on for Helen. But more importantly, he manages to deliver a confidential informant named B.J. (Robert Sheehan) to Hunter. B.J. 's information leads Hunter away from the Ripper killings and to the Karachi shooting that proves so pivotal in the previous film. This is the weakest entry to the series because of its expository nature. That being said, it is a fine procedural with an instructive look into the cop culture of the West Yorkshire Constabulary. It is also a savage indictment of the insular culture of a small town and its police department. Hunter uncovers a shadow police force within the department, one whose motto is, "The North, where we do what we want." Though the Ripper case recedes into the background, it soon becomes clear that it is a reminder to the dirty cops of the earlier set of serial murders. It is also the impetus for Hunter's inquiry into the Karachi shooting, a key building block in the cops' conspiratorial act, without which the crooked detectives' silence starts to crumble. A lot of what one learns in 1980 revolves around the notion that Hunter's honorable and lawful methods serve him no better in his attempt to stand up to corruption than Dunford's foolhardy stunts did. It's a bit obvious, which contributes to the familiarity of this chapter in the trilogy. But pieces are coming together, and as a second act this film is more than suitable in propelling the viewer to the third and final chapter of Red Riding. It opens in select theaters nationwide on February 19th.